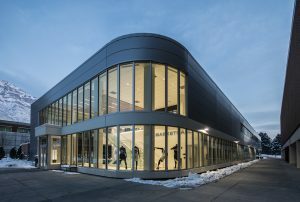 With an assist from donors Rex and Ruth Maughan, BYU built a long-awaited practice facility for its men’s and women’s basketball programs—and an accompanying Hall of Honor for the fans. Photo by Bradley Slade. It’s got Danny Ainge’s (BA ’92) blue-striped high-tops, trophies from two of Jimmer Fredette’s (BA ’16) 10 national-player-of-the-year honors, and Tina Gunn Robinson’s (BS ’80) Team USA jersey; it has nets draped over championship plaques, signed game balls, and a 65-inch interactive display showcasing more than a century’s worth of BYU basketball history. The Rex and Ruth Maughan Hall of Honor, at the main entrance to the 38,000-square-foot Marriott Center Annex, has everything Cougar fans need to relive their favorite BYU hoops memories. “We’re hoping that on game days people will enjoy the displays and look around a little bit,” says D. Duff Tittle (BA ’90), associate athletic director over communications and the primary planner of the hall, which was dedicated with the annex in February. 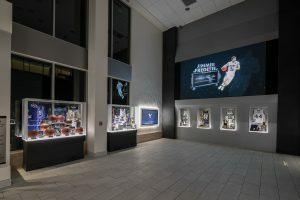 Two large touch screens feature the current men’s and women’s basketball teams, with up-to-date pictures and stats for each player; recent awards are found in nearby cases. On the opposite wall, silver trophies from BYU’s two NIT Championship teams, in 1951 and 1966, are nestled among other awards from BYU’s storied history. The ball from Fredette’s record-setting 51-point performance against New Mexico in 2011 sits alongside the game balls by which Tyler M. Haws (’15) became BYU’s career scoring leader and Lexi Eaton Rydalch (BS ’15) became the West Coast Conference’s all-time top scorer. “We’re hoping that on game days people will enjoy the displays and look around a little bit,” says Duff Tittle. Photo by Bradley Slade. Several items traveled a unique path to the annex. The Ainge BYU jersey—something not even Ainge had—came from a fan who had received it for his 12th birthday; he felt it was time it moved from a display in his home to the university. Players and families donated or loaned championship trophies, uniforms, shoes, record-breaking basketballs, and other memorabilia. Overlooking it all is what Tittle calls the “wow factor”—a massive 13-by-7.5-foot video screen displaying highlight videos and, on game nights, live footage. Cougar fans, it’s time. Generous private donors stepped up to fund the construction and future maintenance of the annex.